Thiomargarita namibiensis is a Gram-negative coccoid Proteobacterium, found in the ocean sediments of the continental shelf of Namibia. It is the largest bacterium ever discovered, as a rule 0.1–0.3 mm (100–300 μm) in diameter, but sometimes attaining 0.75 mm (750 μm). 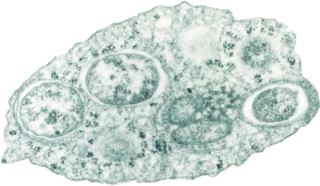 Cells of Thiomargarita namibiensis are large enough to be visible to the naked eye. Although the species holds the record for the largest bacterium, Epulopiscium fishelsoni – previously discovered in the gut of surgeonfish – grows slightly longer, but narrower. The Legionellales are an order of Proteobacteria. Like all Proteobacteria, they are Gram-negative. 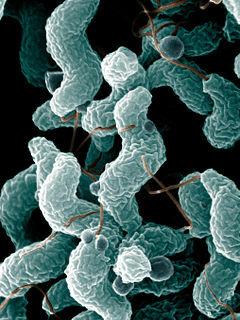 They comprise two families, typified by Legionella and Coxiella, both of which include notable pathogens. For example, Q fever is caused by Coxiella burnetii and Legionella pneumophila causes Legionnaires' disease and Pontiac fever. Desulfovibrionales belong to the Phylum of Proteobacteria, with four families. Like all Proteobacteria, they are Gram-negative. The majority are sulfate-reducing, with the exception of Lawsonia and Bilophila. All members of this order are obligately anaerobic. Most species are mesophilic, but some are moderate thermophiles. The Syntrophobacterales are an order of Proteobacteria, with two families. All genera are strictly anaerobic. Many of the family Syntrophobacteraceae are sulfate-reducing. Some species are motile by using one polar flagellum. The Aeromonadales are an order of Proteobacteria, with 10 genera in two families. The species are anaerobic. The cells are rod-shaped. Some species of this order are motile by a single polar flagellum; others are not motile. The Methylophilaceae are a family of Proteobacteria, given their own order. Like all Proteobacteria, they are Gram-negative. The cells are slightly curved or straight rod-shaped. 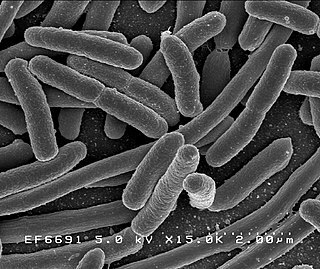 The Cardiobacteriaceae are a family of Proteobacteria, given their own order. They are Gram-negative and rod-shaped, with diameters around 0.5 to 1.7 µm and lengths from 1–6 µm. The Alteromonadales are an order of Proteobacteria. Although they have been treated as a single family, the Alteromonadaceae, they were divided into eight by Ivanova et al. in 2004. The cells are straight or curved rods. They are motile by the use of a single flagellum. Most of the species are marine. Oceanospirillaceae is a family of Proteobacteria. Most genera in this family live in environments with high concentrations of salt; they are halotolerant or halophilic. They are marine, except Balneatrix which is found in fresh water. The Alteromonadaceae are a family of Proteobacteria. They are now one of several families in the order Alteromonadales, including Alteromonas and its closest relatives. Species of this family are mostly rod-like shaped and motile by using one polar flagellum. Mariprofundus ferrooxydans is a neutrophilic, chemolithotrophic, Gram-negative bacterium which can grow by oxidising ferrous to ferric iron. It is the sole member of the class Zetaproteobacteria in the phylum Proteobacteria. 1 2 3 4 "Thiotrichales". www.uniprot.org.